In the US, July is National Bison Month but most people in Europe are totally oblivious to it. I wasn’t even aware of it before being asked to write this blog post in connection with our recent Methods in Ecology and Evolution paper about quantifying population sizes of large herbivores. Some will argue that it is because we don’t ‘do’ day, month, state or national animals on this side of the Atlantic as much as the Americans do. But another reason is that the European bison, Bison bonasus bonasus, is simply not sufficiently well-known or associated with European nature in the public’s mind. This is particularly true in Western Europe where this species has been extinct since medieval times. Early European accounts from North America reported huge bison populations – with estimates of up to 60 million – moving to and fro in the great bison belt. These past migratory movements across the Great Plains are familiar well beyond the US and feed our view of untamed wilderness prior to the impact of European ’civilisation’. In contrast, there are hardly any records of European bison numbers until just before the last wild one was reported killed in Poland in 1921. Stories of extinction, or near extinction, which parallel man’s encroachment into the natural environment fuel the imagination of the public and the researchers alike. And they aren’t restricted to bison being hunted to extinction on both sides of the Atlantic (Australia’s lost megafauna, Madagascar’s, New-Zealand’s, etc. for example). They inspire conservationists to do better and possibly reverse this course of action. Distribution of the European bison, in light green maximum extent during the Holocene, in dark green during the middle ages and in red the loci where the last individuals were hunted in the wild in the 1920s. © Altaileopard. The consequences of these extinctions is now a fast growing field of research in ecology. For instance, I would encourage you to have a look at the recent special issues in PNAS and Ecography dedicated to the topic. The focus is not only on the large and emblematic species themselves, but also on the beneficial impact they bring to their environment and biodiversity as a whole. Jacquelyn Gill’s blog post about American bison wallowing habits is an excellent example of this. The realisation of these beneficial impacts led to the birth of a whole branch of conservation – rewilding – that works towards restoring fully functioning wildernesses that include large herbivores. Rewilding Europe and Rewilding Britain show how extinction narratives can be used to promote conservation efforts. There are some important questions to consider when beginning rewilding projects though: What impact did wild the species you’re planning to re-introduce have on the environment? What were the ecological consequences of its (near) extinction? For European bison – and other large herbivores – answering these questions ultimately boils down to a single question: what were the population sizes of large herbivores in the past? So, how many European bison should we aim to reintroduce across the continent? We can gather many clues from the distant past when large herbivores were more widespread and abundant across Europe, before people tamed most regions with agriculture. With our recent paper in Methods in Ecology and Evolution and our 2013 review paper we develop an existing method – the dung fungal spore method – for this purpose. This method has become staple in palaeoecology and fossil pollen studies, so robust methodological foundations were long overdue. 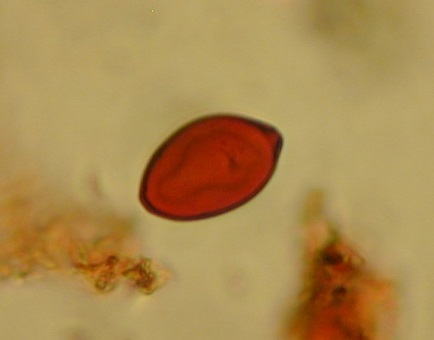 A dung fungal spore as observed during palaeoecological investigations. ©A. Baker. The dung fungal spore method is used to demonstrate the presence of large herbivores on past landscapes and, importantly, their impact on ecosystems. It has already been used in key studies in Madagascar, North America, Australia and the Galapagos Islands. But how does it work? Dung fungi have an unusual life cycle to say the least! Their spores are unintentionally ingested by large herbivores while feeding on vegetation, and germinate after digestion when deposited with dung. Following germination, when mycelium growth is successful, they reproduce by explosively releasing their sticky spores, about 10 to 40 µm in size, onto surrounding vegetation (there are great videos of this here and here! ), ready to be ingested again by the large herbivores roaming around. Because dung fungi are strictly reliant on large herbivores’ digestive tracts to complete this life cycle, when they are recovered in ancient sediments during palaeoecological investigations, they’re interpreted as a compelling evidence for the presence of large herbivores. 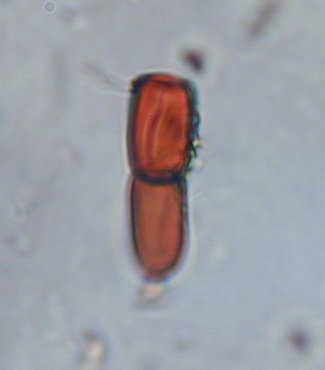 Dung fungal spores require light microscope high magnification for identification and counting. ©A. Baker. Similarly, the archaeological record, based and preserved bones, provides unequivocal evidence for the past presence of large herbivores species. For instance, the presence of bison bones across Europe during the Holocene allows us to estimate the former distribution of the species (see the map above). However, do the bones recovered represent each a regular stomping ground for a large herd or an exceptional outlier? Inferring population sizes is difficult. Our Methods in Ecology and Evolution paper – Quantification of population sizes of large herbivores and their long-term functional role in ecosystems using dung fungal spores – shows that the abundance of dung fungal spore in sediments can reflect past herbivore numbers. Being able to confirm variation of population sizes for large herbivores opens new research opportunities to further understand the impact of large herbivores in the past. This will hopefully help building new evidence-based narratives about bison, aurochs and horse roaming across Europe and inspire more conservation actions and initiatives. The dung fungal spore method we develop in our article promises to help us further understand past variations in population sizes of large herbivores – a critical topic for any future research to contribute to research areas like rewilding, megafauna and ecosystem functions. Not only will it enhance our understanding of the impact of large herbivores onto their environment but it will also help create new narratives about large herbivores that can inspire conservation actions. There is an opportunity here to raise awareness of species such as the European bison and, hopefully, to get a European bison month – or at least a day! To find out more about the dung fungal spore method, read our Methods in Ecology and Evolution article ‘Quantification of population sizes of large herbivores and their long-term functional role in ecosystems using dung fungal spores’. This entry was posted in Conservation and management, Methods papers and tagged Bison bonasus bonasus, conservation, Dung Fungal Spore, Ecosystem Functions, European bison, Extinction, Large Herbivores, Megafauna, Paleoecology, Population Ecology, Rewilding by Chris Grieves. Bookmark the permalink. Most people in the USA are totally oblivious to it. It occurs every July and seems to be mainly a marketing promotion by commercial interests promoting Bison meat.